Earlier this month, BMW proudly announced that the company had delivered 19,016 vehicles to United States customers in January, registering a 5 percent sales increase compared to January 2017 sales results. The month’s performance can be put down to increasing consumer demand for BMW electrified vehicles and continued interest in BMW passenger cars and SAVs. The BMW 5 Series handed in a seventh-straight month of positive sales results, with a remarkable 227.9 percent sales improvement over January 2017 sales on 2,456 vehicles delivered. Of the 5 Series January sales, nearly 10 percent were for the BMW 530e iPerformance plug-in hybrid electric vehicle. The BMW X4 SAV saw a sales increase of 83.4 percent for the month, while sales of the X6 SAV jumped by 24.7 percent over last January’s performance. In a sign of how BMW is at the forefront of automotive innovation, BMW electrified vehicles — the BMW i3, i8 and iPerformance models — accounted for more than 5 percent of BMW models sold in the United States during the month. To take a closer look at our inventory of BMW cars and SAVs, come by our BMW showroom at 3025 Government Boulevard in Mobile. 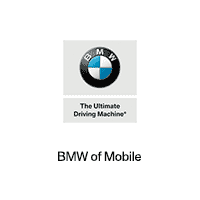 BMW of Mobile	30.6553718, -88.115486.